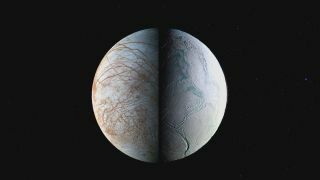 Scientists are eager to explore Jupiter's moon Europa (left) and Saturn’s moon Enceladus (right) because the ice worlds show promising signs of subsurface oceans that could harbor life. For centuries, humans have wondered, Are we alone? and What is the universe made of? Scientists will tackle these exact questions in two documentaries, part of the new, six-episode PBS series "Nova Wonders." "Nova Wonders: Are We Alone? ", premiering tonight (May 9) at 9 p.m. EDT/8 p.m. CDT invites viewers to join scientists in a variety of different disciplines as they all look to solve this fundamental question. The show's hosts explore what different fields of science have to say about the likelihood of life elsewhere in the universe. The film opens with Tabby's Star, a perplexing object that has stirred the curiosity of both scientists and the public, due to its variable, yet pronounced, dimming. This has led to some speculation that it could be surrounded by an alien megastructure, although this is highly unlikely. "We wanted to start off with a mystery," said Teeling, "and so, starting with Tabby's Star is a great place [to begin]." The film leaves from Tabby's Star to discuss the remarkable proliferation of exoplanets humans have discovered in the past few decades — courtesy of instruments like NASA's Kepler Space Telescope — and the conditions that could make them ripe for life. Missions like NASA's recently launched Transiting Exoplanet Survey Satellite (TESS) and the upcoming James Webb Space Telescope will supercharge the search for exoplanets and look for evidence of life in the starlight passing through the planets' atmospheres. The documentary also follows scientists planning to look for life closer to home. Jupiter's moon Europa and Saturn's moon Enceladus both show evidence of vast, liquid-water oceans buried beneath their icy crusts. Scientists suspect these moons could host organisms living off geothermal heat and chemicals in the deep sea, similar to ecosystems around hydrothermal vents here on Earth. And the moons' relative proximity to Earth means we could search for life itself, rather than just its signatures. "One thing that I didn't quite understand until I started working on the film was the significance of finding life someplace else, [even a microbe]" said Teeling. And while "Pond Scum: In Space" might not make a great movie title, it would shake our notions of how common life is in the cosmos. "A second example, even if it's tiny, is such a big deal, because it answers this really integral question of, 'Can life happen more than once?'" Teeling said. "You really felt the connection between Earth and space, and how these telescopes were trying to bridge that divide," she said. SETI's Allen Telescope Array scans the sky in Hat Creek, California, as twilight settles around it. The show "What is the Universe Made of?" premieres Wednesday, May 30 at 9 p.m. EDT/8 p.m. CDT and provides a wonderful introduction to dark matter and dark energy — phenomena so perplexing that their names reflect how little we know about them. Researchers admit that, aside from being able to deduce the presence of these phenomena, they have little idea of how each works. "We have no idea what is the physics underlying it," astrophysicist Marcelle Soares-Santos says in the film, referring to dark energy. The filmmakers traveled the world to explore scientists' best attempts to decipher what dark matter and dark energy may be. "It's an international scientific effort right now," Owen Palmquist, the episode’s producer, told Space.com. "So we very much wanted to avoid the sense that these were American scientists doing this solo." The team's trip to the Cerro Tololo Inter-American Observatory in Chile was particularly memorable. "We got there this first night, and Jennifer Marshall, who was our main scientist down there in Chile, her eyes were so big," said Palmquist. But the excited physicist and her colleagues wouldn't share anything with the crew, since the results hadn’t been verified, Palmquist said. "She couldn't really give us details other than, 'Pay attention to the news in a couple of weeks, this is going to be huge.' [And] 'I'm really happy that there's a camera crew here to film this,'" said Palmquist. A few months later, during their first rough-cut screening, the news finally broke: Scientists had detected gravitational waves from two neutron stars merging. Within minutes, the discovery had sparked an international frenzy as scientists made observations and took measurements across the electromagnetic spectrum, from radio waves to gamma rays. "We literally — just a stroke of luck — happened to be there at exactly the right time," said Palmquist. The team members took their good fortune and ran with it, turning the event into an exciting starting point for their documentary. Around a century ago, astronomers thought the entire universe comprised the stars we now recognize as belonging to our galaxy, the Milky Way. When Edwin Hubble realized that the universe extended beyond the periphery of our galaxy, he also discovered that it is expanding. Over the decades, this has led to a cascade of discoveries and theories, from the Big Bang, to cosmic inflation, then expansion. Dark matter appears to be spread across the cosmos in a network-like pattern, with galaxy clusters forming at the nodes where fibers intersect. But scientists' growing knowledge of the universe exposed peculiar gaps in our understanding. The film touches on the work of astronomer Vera Rubin, who noticed that stars at the edges of galaxies were moving so fast that they should have spun off into space. Rubin conjectured that something invisible must be pulling them together, according to the film. Her observations fit predictions made in the 1930s that some invisible matter was providing the extra gravity that seemed to be needed to keep structures in the universe together. The substance was dubbed dark matter. Knowledge of this extra mass made scientists wonder how much it was slowing the universe's expansion. Measurements in the 1990s led to a surprising result: Expansion was accelerating. "In a multiple-choice test, that's not one of the options," astrophysicist Alex Filippenko, one of the scientists who made the discovery, remarks in the film. Following the terminology that was used previously, they called the phenomenon dark energy. By following their individual inquiries down diverse paths, different scientists wound up approaching the same questions from multiple angles. New surveys, experiments and the arrival of gravitational-wave astronomy have buoyed scientists' hopes that we are approaching a breakthrough. "They're actively changing how we understand the universe," said Palmquist. "Today. Like this week, this month. It's going on right now." Both "Are We Alone" and "What's the Universe Made Of?" will be simulcast on Facebook, where scientists will be taking viewers' questions; "Are We Alone," at 9 p.m. EDT/8 p.m. CDT tonight, will feature Jason Kalirai from Space Telescope Science Institute and John Asher Johnson of Harvard University. Follow Harrison Tasoff @harrisontasoff. Follow us @Spacedotcom, Facebook and Google+. Original article on Space.com.